A recent publication in the journal Palaeogeography, Palaeoclimatology, Palaeoecology unveiled unique fossils discovered by Howard Falcon-Lang. The researcher discovered 318 million-year-old tracks of reptile footprints along the eroding Bay of Fundy shoreline near St. Martins, New Brunswick. The four centimeters long footprints are thought to be left by some of the first vertebrates leaving swampy coasts some 500 kilometers from the nearest seashore. Falcon-Lang said the tracks were likely made by a Hylonomus (which resembles a 20 centimetres long gecko). The Hylonomus, first discovered in adjacent Nova Scotia by J. William Dawson in 1852, is regarded as the world’s first true reptile and ancestor of all dinosaurs. Its discovery was responsible for giving Joggins Fossil Cliffs instant fame as the location that provides the evolutionary evidence that during the Coal Age animals left the water to live on land instead. And to this day, the Joggins Fossil Cliffs are among the most popular locations along the Bay of Fundy coast for fossils. Located in Nova Scotia, at the head of the Bay of Fundy, these 75-foot high cliffs are exposed to constant tidal action. As the 50-foot Fundy tides erode the cliffs, completely new layers of fossils are revealed every 3 to 4 years. At low tide you can comb the beaches and may discover some of the many treasures revealed and left behind by the great Fundy tides, including fascinating fossils. The Joggins Fossil Cliffs remain pivotal to understanding the origins of all vertebrate life on land, including our own species. The Joggins Fossil Cliffs are recognized as a world-class palaeontological site and Joggins Fossil Centre is a must see when you are in the area! It features a world-class carboniferous section, coal age fossils and the world’s oldest reptile fossils. The Joggins Fossil Cliffs are a unique location because, due to grain size and other depositional factors, trace fossils are exceptionally well preserved in its sandstones, shales and limestones. Trace fossils are unique because, unlike regular fossils that are produced only after death, trace fossils show the activity during an organism’s everyday life. Regular fossils show us what animals looked like, but trace fossils provide scientists with clues as to how these organisms moved, stood and lived. It provides details about their stride, etc. and it can even provide a record of soft-bodied creatures that would not have left any regular fossils. Scientists have several theories that all suggest that millions of years ago all continents were joined together. The most commonly accepted theory calls this single supercontinent Pangaea. According to this theory, modern-day New Brunswick was then located in the centre of this continent, far away from the ocean and near the equator. It’s hard to believe now, but New Brunswick once had a tropical ecosystem! Pangaea would later break up into the continents we know now. 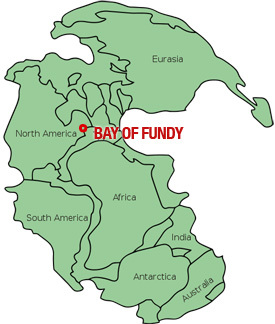 Do you have a question about anything in this article or about anything related to the Bay of Fundy? We’d like to hear from you, so submit your questions in the comments below!